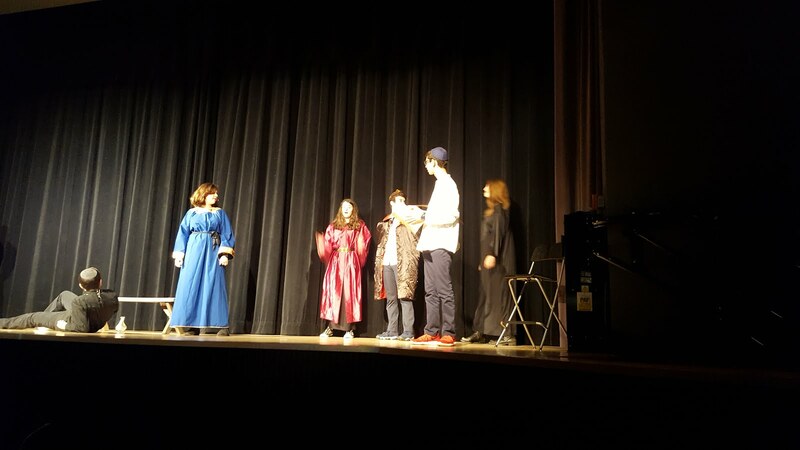 Recently, the Yeshivah of Flatbush Joel Braverman High School freshman and sophomore grades had a short break to enjoy a little comedic theater in the midst of this very hectic and stressful time of year. The play, Drop Dead Juliet, was written by Allison Williams, whose credits include a role in the HBO hit show Girls, and the screenplay of the recent movie Get Out. Performed by our wonderfully talented Drama Troupe, the play explores what would happen if Juliet decided to change the script so that it would have a Hollywood ending instead of the tragic one we all know so well. The play opened up with Juliet, played by the talented freshman Channa Rand in her first, though probably not her last, starring role, waking up right after Romeo had ended his life. Instead of following suit Juliet decides she can’t go through with it. William Shakespeare, wonderfully performed by sophomore Perry Sanders, the young veteran of the Flatbush stage, finds himself forced into giving Juliet a chance to change the script. What follows is a mash up of classical Shakespeare together with modern sensibility and a whole lot of silliness. 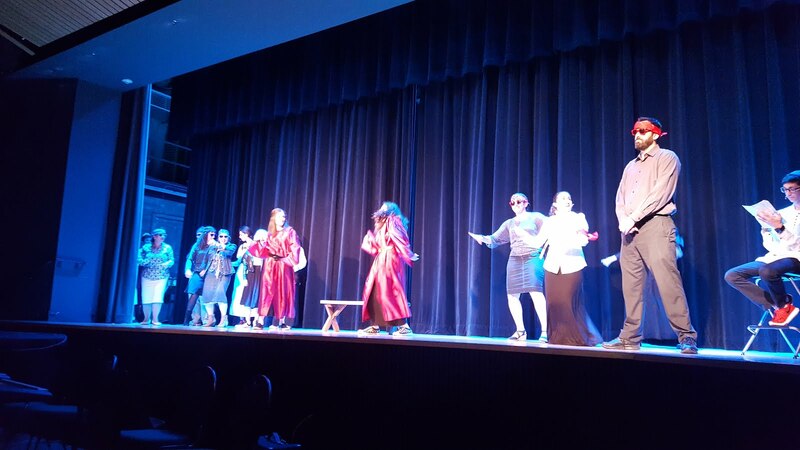 With a cast of 13 students, including freshmen, sophomores, juniors and even Ms. Marcus, all those who had an itch for the stage had an opportunity to show off their acting chops. We even had the pleasure of seeing a horde of freshman and sophomore teachers (Dr. Fruchter, Senoria Ovadia, Ms. Agassi, Ms. Coopersmith, Ms. Mikhli, Mr. Kweller and Mr. Katz) take the stage to join in on a Capulet and Montague dance off! Freshman Noam Weinstock, making his acting debut, playing a Romeo still very much in love with Rosaline. Freshman Jacob Jackpot Rishty took on the challenging role of Prince/Princess attempting to keep the peace on the streets of Verona. Freshman Hannah Hasson and sophomore Esther Hidary took on the comedic roles of Sampson and Gregory, making great use of their flashlight app and attacking with all forms of social media. Freshman Sarah Dagmy took on the pivotal role of Sister Lawrence, basically Romeo’s shrink, keeping notes using her slightly over the top quill. The mothers of the star crossed lovers were played by the expert dancers juniors Isabel Lin and Jessica Vaysman, with perpetual star junior Aida Hasson lending a hand as the ever dependable nurse. We were all entertained by the epic light saber battle between Tybalt, played by sophomore Rebecca Coopersmith, and the gangstah rapping Mercutio, junior Sarah Cohen. Capping off the cast Ms. Marcus took on the dual role of the tough talking Abram and the tough love Lord Capulet. Of course none of this could have been possible without the overbooked and overextended AV squad headed up by Yair Chaya and Jacob Kahlili and the wonderful leadership of Commissioner and assistant director senior Max Shemtob. All in all they did myself and the Yeshivah proud.